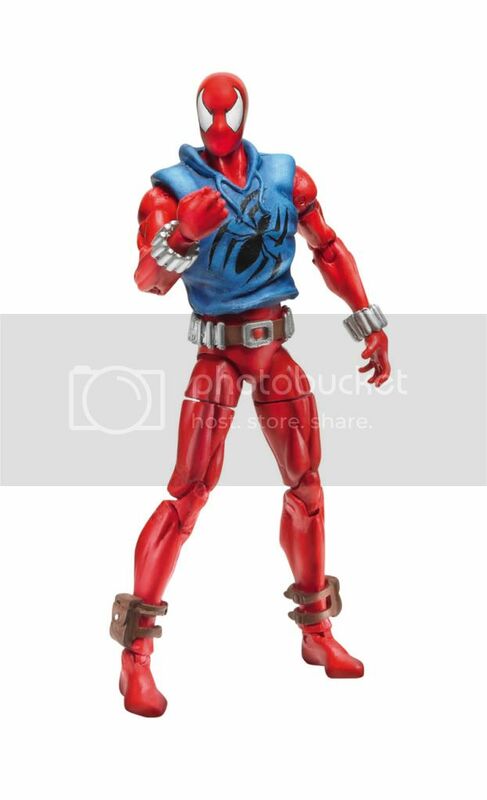 Discussion in 'The Comics' started by Thread Manager, Jan 28, 2011.
i dont collect figures, but i do collect ben reilly stuff so i will be getting this! Penciled by MARK BAGLEY& JOHN ROMITA JR.
Cloned years ago by professor Miles Warren, Peter Parker long thought his doppelganger dead. But as the nineties proved, he thought wrong! In this Clone Saga sampler, discover what happened during those missing years to Peter&#8217;s double, who took the name Ben Reilly! Then, swing into action with these two brothers-in-arms as they get their team-up on to battle the evils of the Jackal (Warren himself! ), the Scrier and Judas Traveler. But can even Spider-Man and the Scarlet Spider save Aunt May, who lies at death&#8217;s door? Is it just collecting old issues? And also I wonder why since there are the clone saga epic books being released these days. you are definitely thinking of a different figure. 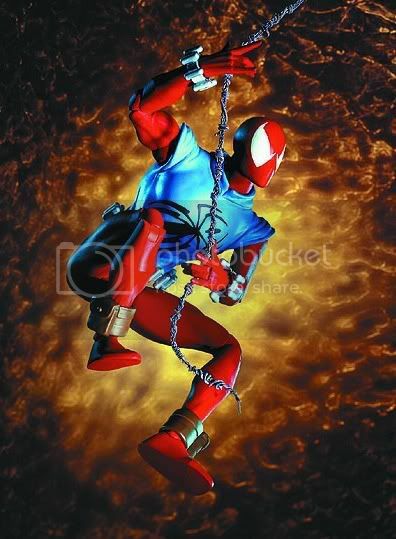 You're thinking of the figure that was from the 6" spider-man classics line way back in 2001 which was produced by Toy Biz . It was originally supposed to be a part of series 2 but was scrapped and replaced by daredevil, and was then eventually released as a kb exclusive. this new figure was just debuted this weekend during toy fair 2011 and is for the 3 3/4" Marvel Universe line that Hasbro is producing. Here are some pics to compare. Nice. I prefer him with the hood intact. wheres the solicit for part 1??? I have no idea what that is supposed to be. And yeah wheres part 1 lol? I couldn't justify spending $10 on a 3" figure, otherwise I woulda bought the Ben Spider-Man I saw at TRU. "Long thought dead" as in "I though I threw him in the smokestack back around ASM #151??" I cant make heads or tails of this great responsibility arc. From the sound of it, it's just filler material...something to tide us fans over until the rest of the clone saga/ben reilly epic trades are released. But that whole "new material" teaser is a real head scratcher..
People are getting excited over relatively nothing. It sounds like it's just reprints. The "long thought dead" obviously refers to the smokestacks thing from ASM #151. And Ben might come back, but nobody in their right mind would bring back Traveller. Mark Bagley was the artist for a lot of JM DeMatteis' Amazing issues, so it's probably collecting those... AND the Lost Year back-ups that JM did with John Romita Jr. It's obviously a reprint, but why make a sampler comic like this now and not months ago when clone saga epic #1 was out????? So enforcer, have you taken any pics of that 10" spider-man figure yet? I actually disovered an unofficial variant of that figure. 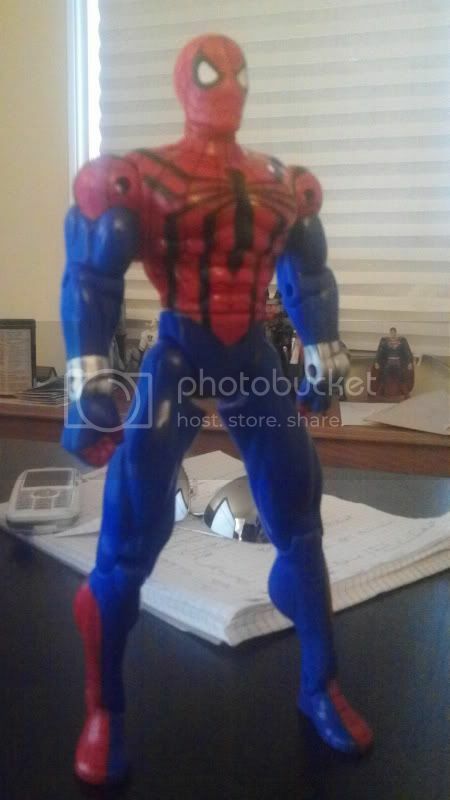 it's one of the figures from the Spider-Man: Adventure hero line. the figure was called Deep sea spidey or something to that effect. but instead of him wearing peter parker's traditional spider-man costume underneath the diving suit, its a red and black version of reilly's costume. This is the best picture I could find but look closely at the arms. you can clearly see the painted on webshooters and the 3 red fingers. Sorry finally got the camera today. Not a great pic but it gets the idea across. GUYS! Pick up today's issue of ASM! Scans of the Reilly relevant panels (pages?) would be much appreciated. Quick question, was the Jackal the 90's incarnation or the 70's incarnation? 90's I guess. He looked a lot like Jack (his mini pal) with the big ears and stuff. In that panel, I see (besides Kaine, Ben, Marla and Gwen) ... the kid who collects Spider-Man, Lance Bannon, Nick Katzenberg (pretty sure, but not positive about that one), Ned Leeds, Mattie Franklin, Fredrick Foswell, Jackpot, George Stacy and ... a bunch of people I have no idea. One in the background of the second panel looks like the model that hit on Peter just before the Shocker destroyed the train he was on back in ASM #579 I think.